They’re super-colorful and have a very strong, consistent style. 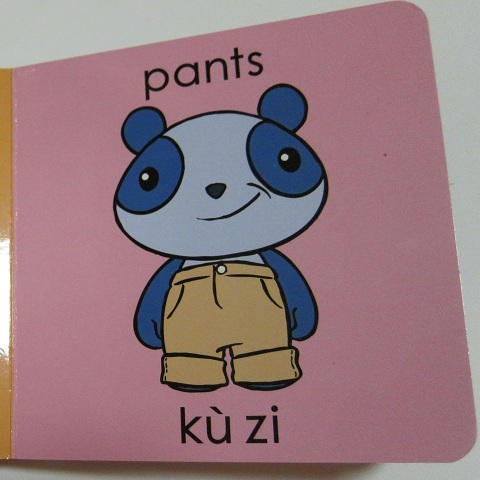 They’re also ideal for situations (like ours) where only one parent has familiarity with Chinese: each word is presented in English, pinyin, simplified Chinese, and best-guess American phonetic spelling. (The phonetic spelling is of limited value – if you can’t read pinyin, you’re unlikely to get the Chinese pronunciation right). Gordon & Li Li Words for Everyday is the first book in this series, and we bought it for Jacob almost right away. These are words that are super-useful for American babies: “boy,” “girl,” “ball,” “book,” “cup,” “milk,” and, yes, “cell phone” are all in there. 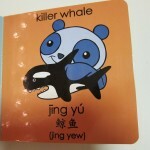 Our edition only includes English and pinyin on each page, which for us was enough as we were focusing on just getting Jacob to hear the sounds of the words. (For overachievers, the simplified Chinese are all listed in the back in a glossary of sorts). I’m happy to say that Jacob can understand at least two-thirds of the words in this book. He doesn’t always prefer them over the English when he speaks, but he certainly responds to the Chinese. (One of his favorite words in the world is “ba bu ball,” or basketball, and all variants on the word “ball,” but today when I asked him for the 球 (qiú), he went and got the ball without hesitation). 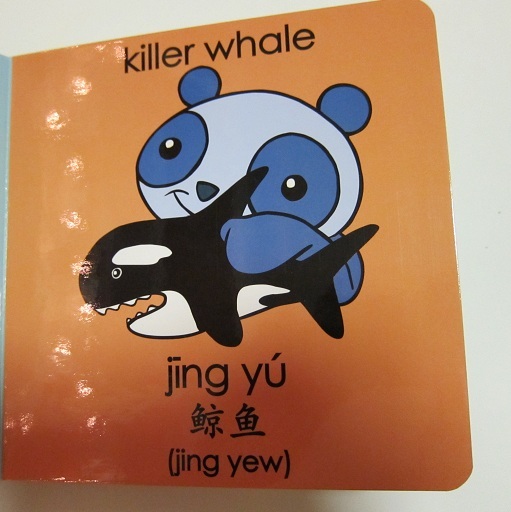 Jacob’s Jewish grandmother got him Gordon & Li Li Learn Animals in Mandarin as a gift, and it is great! As someone who had an incomplete education in Chinese, learning to say 企鹅 (qì’é) is a lifesaver in the post-March of the Penguins era. It’s also nice that there’s no overlap with Words for Everyday — “dog” and “cat” are excluded. My only criticism of this book is that some of the animals are just a tad too stylized – the alligator in sunglasses, for example, or Gordon and Li Li themselves (blue and pink pandas). On the other hand, the ducks, chicken, and frog all have a certain, endearingly Chinese-cartoon quality to them. There’s a third book, Gordon & Li Li Count in Mandarin , which haven’t gotten because we haven’t needed help with counting in Mandarin. And we’re totally excited that a Gordon & Li Li Learn Animals in Mandarin iPad app is coming out soon! Now we just need to get ourselves an iPad. We’ve shared our enthusiasm for Speak and Sing Chinese with Mei Mei, but while Mei Mei wins top points for enthusiasm, her production values leave a bit to be desired. Also, CD liner notes just don’t cut it for toddlers to read. So we were excited to receive this book-and-CD set as a gift for Jacob from Gene’s sister. 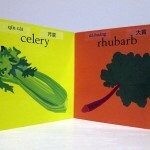 Chinese and English Nursery Rhymes: Share and Sing in Two Languages is a nice hardcover with colorful illustrations, and the music on the CD sounds professional and clear. You get a lot of content for your dollar: 20 songs in English and 20 in Chinese. The price is worth it for the CD alone! And you’ve heard many of these songs before, so it’s easy to sing along. I find the pages just a little too crammed and the typeface too small. This allows more songs to fit into the pages, creating good value, but that makes it hard for Jacob to ask for one particular song (or for me to read the lyrics when the lights are dim). The pictures are vivid and interesting, though that can make the text even harder to read (for example, when printed black-on-blue). The songs are organized thematically (Outside, Inside, Party, Play, Night), but I think there could have been even closer alignment among them. “Twinkle Twinkle Little Star,” “Happy Birthday to You,” and “Heads, Shoulders, Knees, and Toes” are matched with their Chinese translations, but more pairings would have been nicer for purposes of language acquisition of parent as well as child. To be honest, I’m not entirely sure why there are English songs in here that aren’t translations of the Chinese. If I wanted music in English, I’d go buy that separately – as nice as these songs are, there are better from American artists. Overall, this book-CD combination is well worth its value – I recommend it, despite the criticisms above. So far, Jacob has not been smitten with this book, but he’s still at the stage where a single-song book, or just humming a tune, is his best way of asking for music. Maybe as he gets older this book will become more fun for him. 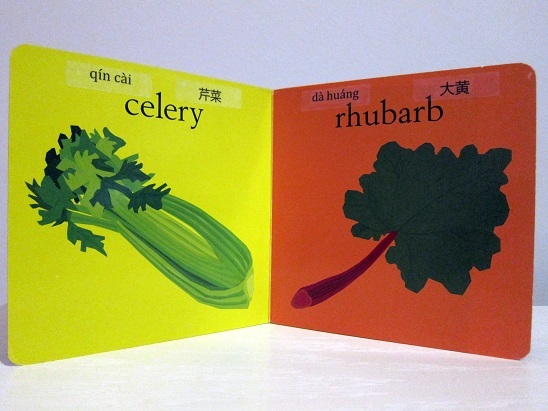 Speak & Sing Chinese with Mei Mei is one of the best resources we’ve come across for getting Chinese into a predominantly English-speaking family. The CD comprises a mix of basic vocabulary lessons and songs that incorporate those words. For example, the lesson on body parts is followed, naturally, by a Chinese version of the well-known English children’s song Heads, Shoulders, Knees and Toes. There’s no drilling on tones, grammar, or any of that, just “repeat after me” words. Jacob loves this CD; for a while, it was an indispensible part of his morning routine. As we’re still waiting for his first words of any language, we can’t know if he’s learning any Chinese (or English). Gene: I think this is a wonderful resource for both children and parents. Songs and music are fun and much easier to remember than just vocabulary words themselves. I find myself humming or singing many of the tunes from this CD throughout the day. Mei Mei exaggerates her pronunciation and tones, which I think makes it easier for a non-Chinese-speaker to pick up on the hardest aspects of the Chinese language. For whatever reason Hu Mei Mei isn’t selling the rest of her resources on Amazon, but you can find them on her site, Mei Mei and Me. The DVDs (and VHS!) seem quite dated; I hope she does some upgrading soon as I really like this introductory CD. Highly recommended!